It was a hard life for Sarah Ann Seres who was widowed twice due to colliery accidents. Her story is similar to that of many other wives of miners and colliery workers. There was no certainty that husbands would return from work every day and widows and orphans usually had to rely on charity after the death of a husband and father. 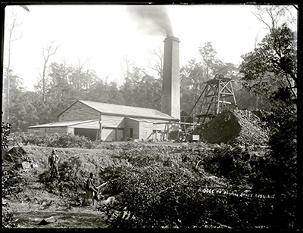 Sarah Ann Seres had a three week old baby and three young children when her French born husband, Peter Seres, aged thirty-seven, was killed in an accident at the Scotch Australian Company Mine, at Lambton. He was one of four men who were in a sinking pit at four in the morning when a rope attached to a tub of rocks broke. Peter Seres was killed instantly when the rocks fell on his head. The falling tub put out the lights and the other three men were left in darkness in rising water. The water had risen to waist height by the time they were rescued. It was the 12th October 1869. Mrs Seres remarried several years later, her new husband, Thomas Gillons, worked as an engineer in the mines. He also died in a fatal mine accident on the 28th June 1890 when a boiler burst at the Lambton Middle Pit. He was not regularly employed there but was relieving another worker on that day. He was fifty-six years old. Sarah Ann was left with one son from the marriage. In October of the same year, Sarah Ann Gillons’ daughter, Sarah Carlson also died, leaving her widowed Mother to help raise another five children. “Boiler Explosion at Lambton Middle Pit.” Newcastle Morning Herald 30 Jun. 1890, cited in Old Wallsend Cemetery, New South Wales 1863 – 1896 Book 1, Adamstown: Newcastle Family History Society Inc., 2000: 89. Print. “In Memoriam.” Newcastle Morning Herald 1 Jul. 1891, cited in Old Wallsend Cemetery, New South Wales 1863 – 1896 Book 1, Adamstown: Newcastle Family History Society Inc., 2000: 220. Print. “Lambton Fatal Accident.” Newcastle Chronicle 14 Oct. 1869, cited in Old Wallsend Cemetery, New South Wales 1863 – 1896 Book 1, Adamstown: Newcastle Family History Society Inc., 2000: 220. Print. Letters to the Editor, Newcastle Chronicle, 4 Nov. 1869, cited in Old Wallsend Cemetery, New South Wales 1863 – 1896 Book 1, Adamstown: Newcastle Family History Society Inc., 2000:219- 220. Print. Newcastle Family History Society. Old Wallsend Cemetery New South Wales 1863-1896, Book 1. 2000:9. Print. “The Late Fatal Accident at Lambton.” Newcastle Chronicle 16 Oct. 1869, cited in Old Wallsend Cemetery, New South Wales 1863 – 1896 Book 1, Adamstown: Newcastle Family History Society Inc., 2000: 220. Print.